We had two more cooperative coaching sessions today. In the first session teachers and parents were teaching Reema to identify items that she would use in the bathroom and identifying parts of her body. She made particular progress with requesting for the items that she wants. Previously she needed prompting to say the name of the item to request it but today she made a number of independent requests. When talking about her future, Reema’s mother said that she was afraid that she won’t have other opportunities to get the same services and training that we have been able to provide for her. She said, “You take care of me and my other children too, not just my child with autism”. Initially Ali was lying on the floor during his session and did not appear to be motivated by the toys and activities that were available, but our team did some creative problem solving with the group and discovered that he really enjoys physical interactions, for example, spinning him around or squeezing his shoulders. Once we’d coached the teachers to find what he was motivated by he was much more engaged with the instructions that they were teaching him to follow. In the afternoon we had a session with some of teachers in the programme. The teachers rotated through small groups and we used coaching and role play to work on how they would teach specific skills. In one group they practiced how they would teach a child to imitate their actions and follow a variety of vocal instructions. In the other group they focused on how they would teach a child to answer vocal questions such as “what is your name?” or “how old are you?”, as well as working fading prompts when teaching a child to request. The teachers also practiced collecting data on the skills that were being taught. The teachers made lots of progress and this was a really fun session- our team particularly enjoyed acting as children for the teachers to practice with. One of the teachers told us that it was really good to focus on learning to teach specific skills and get more feedback. We headed back to the apartment feeling satisfied and proud of the progress that our teachers, parents and children are making, and eagerly started planning our next sessions. 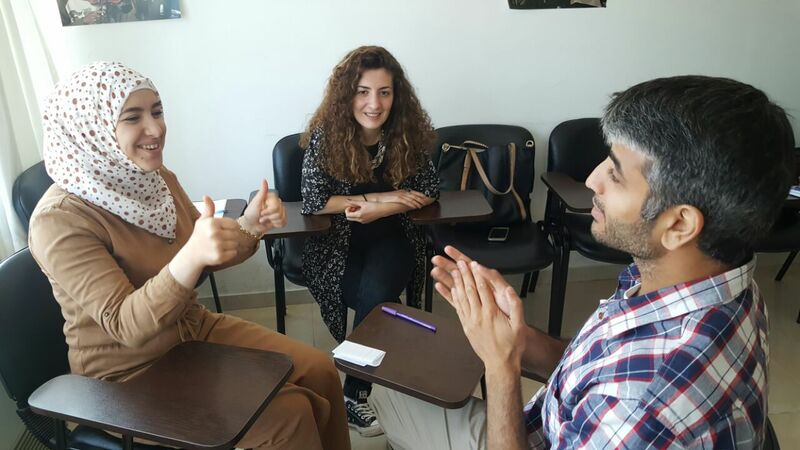 Our cooperative sessions today were with Amjed in the morning and with Haya in the afternoon. We planned for these sessions yesterday and prepared the items we needed this morning. The focus of our cooperative sessions today continued to be receptive and expressive communication skills. We also incorporated data collection sheets into the sessions for teachers and parents to have them practice taking data on the receptive and expressive skills they observed throughout the sessions. The structure of each session today was that Sarah and I demonstrated a skill in front of parents and teachers, practicing that skill with each teacher and parent, and then gave the teachers and parents chances to work directly with the children. Yesterday we asked Amjed’s mother to bring clothing items for him (t-shirt, shorts, socks and shoes) so that he could practice identifying common items. We also intended to work on some simple imitation skills. Sarah and I demonstrated those skills to the mother and practiced them with her directly. However, Amjed was crying to get his mother’s attention during the practice. Therefore, we decided to start coaching Amjed’s mother to ignore his crying, while teaching him a more appropriate way to get her attention like pointing or tapping on her shoulder. She was doing a great job ignoring his crying. It can be very difficult sometimes to ignore your child’s crying, but this is the way to teach him a more appropriate way of communicating what he needs. We were so excited today when Haya made some vocal approximations independently to request for the bubbles and the ball. She successfully followed instructions by identifying some body parts like head, hair, eye, ear and mouth. Today, we found out that she liked to use the marker on the white board. So, her mother used this activity as a reward to motivate her to continue on identifying body parts. Towards the end of the session, Haya was bored and started crying and throwing objects around the room. Her mother did a fantastic job ignoring those behaviors. She was also doing a great job giving the instructions once and sticking to one form of the instruction without repeating it several times. We are so proud of you, Muna! Since coming back from the center, we have been working on planning for tomorrow’s cooperative sessions and doing some individual work that we were each assigned. This afternoon, after a full day of community outings and support groups, one of the employees at the center where we host our program pulled us aside and told us about the place she used to live in Syria. She had a normal life back then, she told us. Then, ISIS came and everything changed. She had a normal life in the same way that 7-year-old Hani, who we took on a community outing this morning, had the opportunity to attend a nursery school. She had a normal life just like Huda and Muna, two mothers in our support group, who shared that they used to like to go horseback riding and swimming when they lived in Syria. They had “normal” lives…but the war came and everything changed. They do not have these opportunities anymore. In a joint parent and sibling support session this afternoon, 7-year-old Masoud shared that he dreams of going on an airplane someday. “If we are ever allowed to travel…” the mothers in the room responded. The mothers reminisced about past travel experiences while the siblings dreamed about where they might like to go someday. For now, they have few options, and with survival at stake, few of those options are options at all. 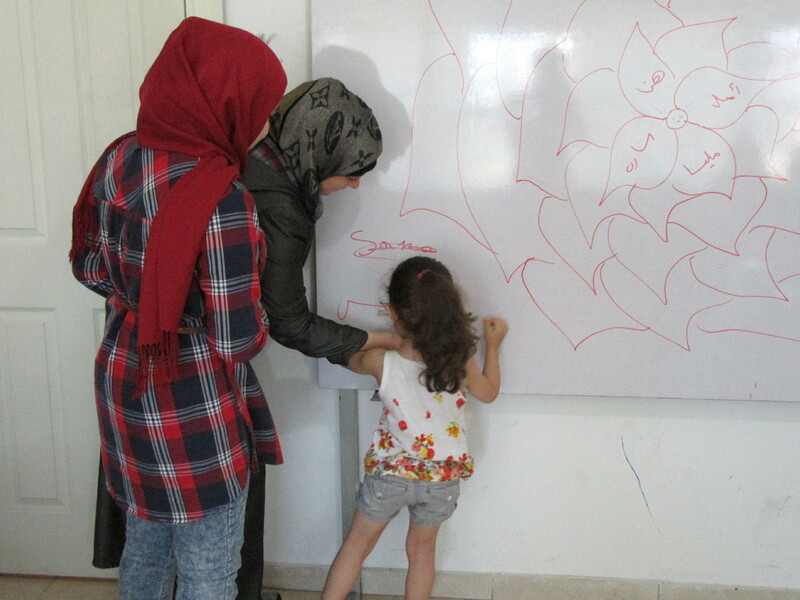 With all of the focus that the mothers and siblings in our program place on others, we used today’s support session to get them thinking about themselves and their own talents, strengths and abilities. Enter A Global Voice for Autism’s Got Talent! Round 2! Today, we encouraged the families to think about their own strengths and to perform one of their talents for the group. Lama started out our talent show by showing off her mandala drawings and sharing that these drawings help her relax and de-stress. We later had Huda share pictures of her cooking, had 12-year-old Basma teach the group some Korean words and had 10-year-old Taima sing a Turkish song. After concluding the individual portion of the talent show, we divided participants into groups and had them perform group talents. We had a dabke line, a group drawing and a leg tapping game among our many talented performances. Our team even performed the “Cups” song for the families at the end. We then asked the families to reflect on their experiences. “I felt really happy after I shared with others and they responded positively,” Lama said. Huda commented, “This was the first time I’ve ever had the chance to stand up in front of people and talk about things that I like.” We ended the session by asking the participants about talents that they have that they wish they had more opportunities to use and gave all of the participants an assignment to spend 30 minutes this week doing something that they love to do for themselves. “I like to take pictures and keep them all so my phone memory is always full,” Lama said. “I am good at soccer and want to play every day,” Masoud, 7, said. “I used to read, but I stopped after getting married and want to do it again,” Laila said. “I have a lot of responsibilities that take up all of my time,” Muna commented. “I like to make meals that my children like and do things that make them happy.” That was a theme that resounded in all of our conversations today…thinking about how we can live our lives in ways that make the world better for others, in spite of the circumstances, in spite of the fact that the world can flip upside down and inside out overnight. Because at the end of the day, we are all just trying to be good in this world. What more can we each strive for, really? Today, all of us woke up homesick, as we’ve been away from our families and friends for one and a half months now. Even though we were on the same page of homesickness, we were also on the same page of being excited for meeting with the teachers and families to conduct our sixth training in this program entitled, “Data Collection”. The second slot was dedicated to presenting about data collection, a practice that distinguishes the behavior analysis approach from any other approach in the field. We taught teachers and parents some efficient methods they can use to gauge their children’s behavior, and measure if a specialised intervention or replacement is effective for the child they work with. We also practised using graphs and data sheets by observing some of the example behaviors Sarah illustrated and writing down information like frequency, duration, and percentage on her behaviors. Lama, one of the parents, really liked this method, and added, “Data collection was used with Reema when she used to attend a special-needs center in Syria. I didn’t know that my daughter couldn’t use a straw one year ago until I looked through her file.” By the end of the training, we were surprised by how fast some participants grasped the concept of data collection and noticed some behaviors that some of our team members frequently do during sessions and cooperatives. One of their many remarks was about how I flip my hair to the other side 55 times a minute. I was really shocked by the fact that I do this behavior because I was not conscious about it. After this intense training, we went home to prep for tomorrow’s community outings, the first community outings since coming to Mersin. We also planned for parents/sibling support groups, which are getting more exciting with every session. We are can’t wait to see siblings and parents put their talents into display tomorrow! This weekend we took a trip to Kyrenia in Northern Cyprus. We arrived on Friday evening and were very excited to find that our hotel had air conditioning, a luxury that we haven’t had in Mersin. 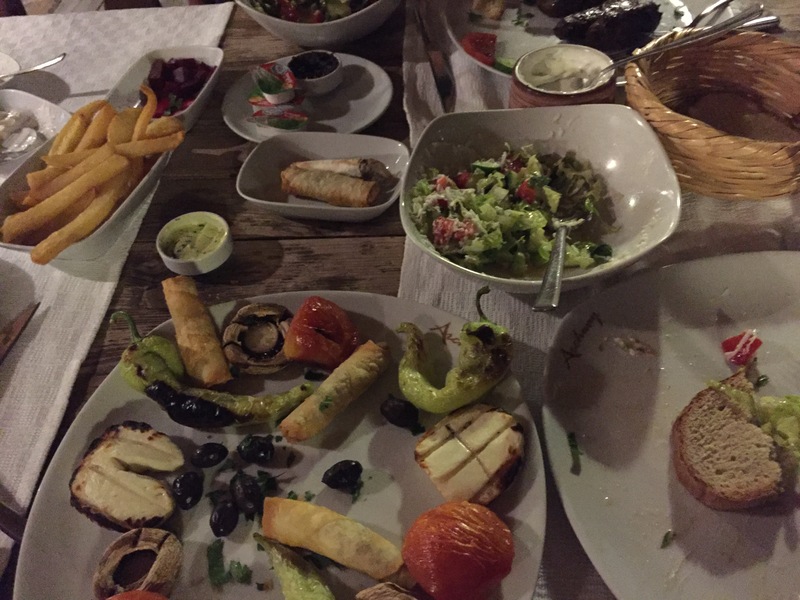 We had a delicious meal at a restaurant next door to our hotel and made plans for the weekend before heading to bed. After breakfast the next morning, we asked about the best way to walk into the centre of Kyrenia and were told “the best way is to take a taxi”. Undeterred, we set off walking with the help of map apps on our phones and some vague directions. It was a pleasant walk of several miles before we got to the main area in Kyrenia. We wandered around exploring the centre of the town and the harbour, and also visited the castle. It was a maze of stone passages and tiny rooms as well as a small museum with a shipwreck dating back 2300 years. In the afternoon we headed over to one of the local beaches to swim. 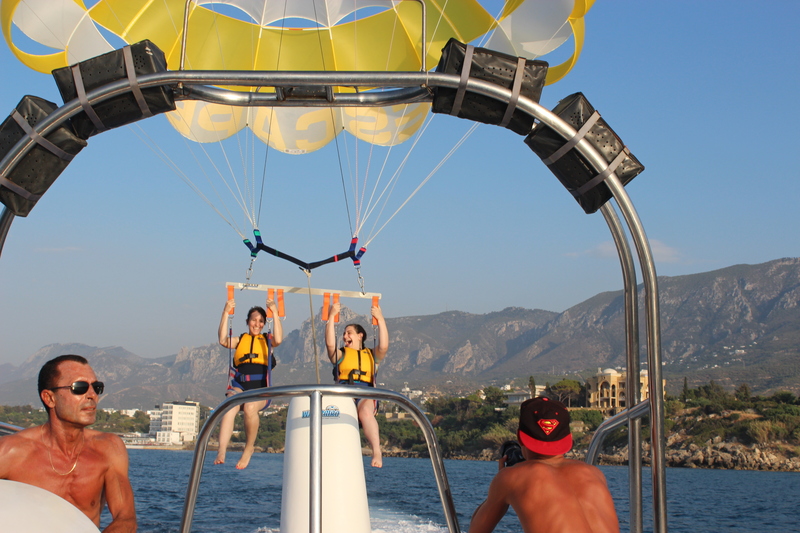 We also tried parasailing (being thrown off the back of a boat into the air attached to a parachute), which was surprisingly relaxing. In the evening we had the best local recommendations as we went out for dinner with a friend of Melissa’s who lived nearby. On Sunday we travelled back to Mersin and got the local bus back to our apartment, where we spent the evening relaxing and preparing for the week ahead. We began this morning with our team meeting, discussing our tasks for the day as well as what was planned for next week. From our previous team discussion, we decided to create our own video examples of the skills we were teaching in sessions. These videos will be embedded into our lessons to support the learning of our training participants. It was quite interesting watching Sarah and Amal as they acted through the various scenarios. Sarah acted as the learner, and Amal was the teacher. For those of you who don’t know, Sarah’s baseline demeanor is calm and pleasant, making her an ideal flat mate. The behaviors she engaged in during the role plays were quite astonishing all things considered. Seeing how far she could take her tantrums made me appreciate her even more than before. It was funny to notice myself cringe when Amal reinforced Sarah for engaging in her tantrums. Even knowing that they were just role plays, I couldn’t stop my gut reaction. In response to some of the feedback we’ve been receiving from teachers, we will be adding additional training sessions for our group of teachers in the next few weeks. I will lead these upcoming trainings and will focus on using evidence-based strategies in the classroom. We will go over the implementation of evidence-based strategies to support academic learning as well as using it to manage class-wide behavior. While the majority of the team stayed home to prep for the coming week, Amal went to the center to provide a make-up training to one of our families. After a productive day, we were able to enjoy a little time together at home. This weekend, some of us will be parting ways. Amal is happily expecting family to come into town, and Melissa, Sarah, and myself will be going to Cyprus for a weekend getaway. 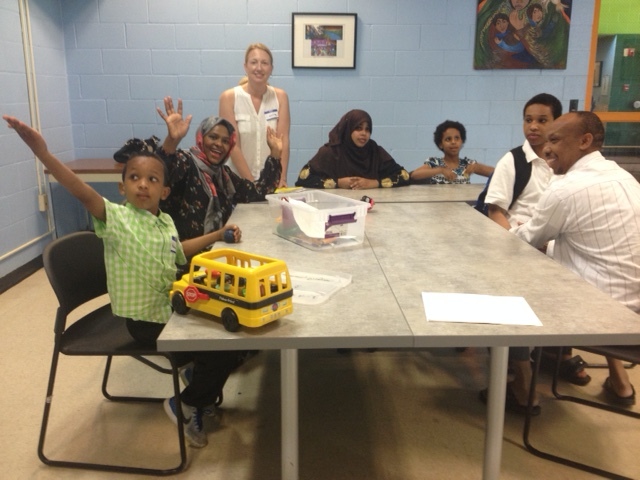 News From Our Somali Program! This past Saturday was our first parent/child class. Ann was there too which was another wonderful addition! We were going to have them practice identifying ABC’s but some of the children started demonstrating behavioral problems so we switched to talking about what was happening right there. With that, we identified the ABC’s, identified the function and then started prompting replacement behaviors. Ann jumped in with explaining how powerful a parent’s attention and praise is when trying to reinforce appropriate behaviors. We also explained the importance of remaining neutral and how to NOT give attention to the children when the inappropriate behavior was functioning for that reason. We did this type of format for each parent– if the child was demonstrating a behavior, we used that as the example and then started on how to teach a replacement behavior. In the second hour, one of our fathers came in with his son. His son appeared to bite his own arm as a way to get more attention from his father. His father is very loving and basically gave his son attention no matter what he was doing. It was an opportunity to explain the function of the biting while teaching an alternative way his child could get his attention. This father started practicing right away. He was very excited and said he learned something that day! I gave parents from the second group one thing to practice until we meet up again. Each practice exercise is related to a target behavior they most are having difficulty at home. After we identified the ABC and the function, we offered an alternative replacement behavior and how to teach it. They will report their experiences at the next class. Today was the second day of cooperative sessions for the week. 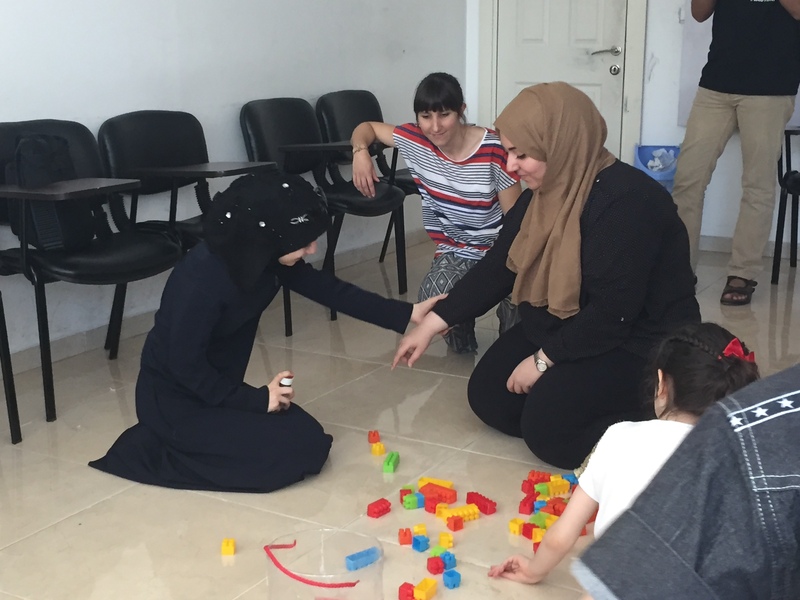 Our team planned for the sessions in the morning by organizing the demonstrations and rotations for the parents and the teachers and planning the activities and materials based on the toys each child likes. We started the sessions with a quick review of the previous training about receptive communication. Instead of having two of our team members demonstrate the skills, we had the parents and teachers participate directly in the demonstrations. Each parent and each teacher got the chance to be a student and a teacher once. The skills we worked on today continued to target expressive communication skills and added in receptive communication skills-building activities. We also focused on having the teachers become ‘source of fun’ for the children. This meant that for the first few minutes working with the child, the teachers were not placing any demands. Our morning session was with Reema and Ali, their parents and the teachers. Reema enjoyed playing with the ball and eating chips. The teachers who worked with Reema gave her those items only if she requested them using a 2-word request (I want the ball or I want chips) in Arabic. She successfully made many spontaneous requests without prompting. Using the puzzles, the blocks and the clothespins, the teachers worked on receptive communication skills like identifying the colors and putting the puzzle pieces together. For Ali, our main goal in this session was to fade away the presence of his mother in the session, as we noticed in the previous sessions that Ali was very dependent on her. We had separate rooms for Ali and Reema today to help achieve this goal. The first stage was to keep Ali’s mother sitting next to the door and to not have her give any type of attention to Ali. Then his mother left the room for 5 minutes, and came back again. After that she left the room for 20 minutes. At the beginning, Ali was very upset after his mother left the room. However, few minutes later, he started playing with the teacher and was enjoying blowing bubbles and rolling the truck on his arms. 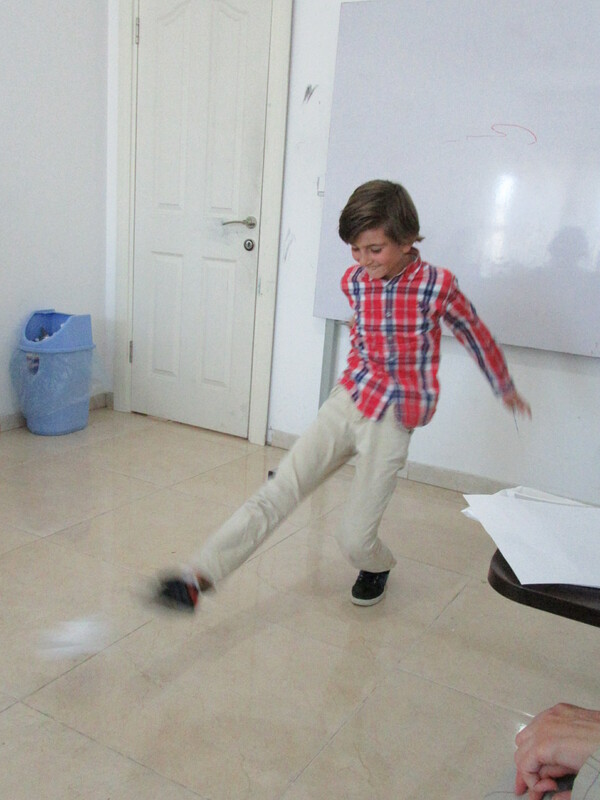 He successfully followed the teacher’s instructions that targeted receptive communication skills. Our afternoon session was with Hani, his mother and the teachers. 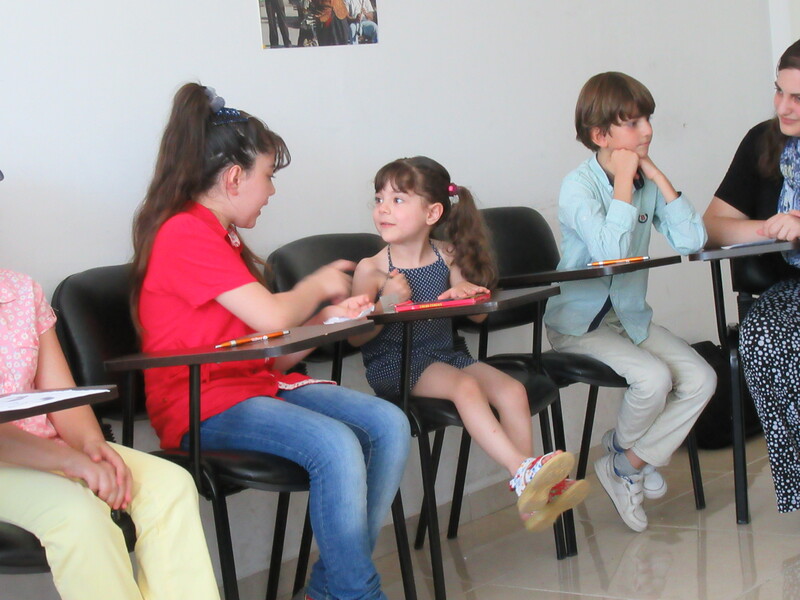 After the quick review and the demonstration with his mother and the teachers, one teacher started working with Hani. For most of the session, Hani was very motivated to request the crayons to draw and color the paper. Other times he liked playing with the ball and the playdough. The receptive skills he worked on mainly included asking him to draw different shapes, letters and numbers. Hani requested for the items he liked using up to a 3-word requests. Hani knew his colors independently but was struggling to pronounce the color green in Arabic (Ahdar). When his mother prompted him to say “ah,” he would complete the word by saying “dar.” We were so excited when he finally pronounced the word correctly and apparently he caught on to our excitement over his imitation because when Hana translated the words “What is it?” to Sarah, Hani repeated “What is it?” in perfect English! Today we also conducted short interviews with the teachers to give us general feedback about the training. Stay tuned to know more about our teachers’ comments! Rana S. is a first grade teacher for Syrian refugees in Turkey. Today, we spoke to Rana about her thoughts on the program so far and her goals moving forward. I am learning how to support people with autism and am finding different ways that I can teach them. One valuable skill I learned, and that I now use with my own son, is to immediately reinforce behaviors that I want to see. I used to delay reinforcement for one or two weeks, but now I use verbal praise all the time and I can see the changes. He has now started doing his homework on his own and writing paragraphs. He listens to me like he never has before. He used to while and complain about everything but he doesn’t do this anymore. Now, when I ask him not to do something, he listens and doesn’t do it. These trainings have taught me that I need to be more patient in my classroom and that I need to assess the individual learners and find out what works for them. Before I set a goal for a child, I need to know what that child needs. Now that I have learned to identify the functions of different behaviors, I have a better understanding of these needs. I used to walk into class and demand that the children “be quiet and open their books” and would just repeat this demand until they did it, but now I will use the different strategies I am learning with each child because I learned that each child is different. This is my first year teaching first grade and I had some difficulty figuring out how to handle behavior problems and learning differences in my classroom. The training is teaching me how to do this. I’ve also learned to only reinforce good behaviors that I want to see more of in my classroom. I used to accidentally reinforce some challenging behaviors but now I am careful about what I am reinforcing. I have one student in my class who doesn’t like to sit in his chair and who disrupts the class by talking a lot. When he participated appropriately in class and answered a question in class and did his homework, I reinforced his behavior by drawing him a picture and writing him a thank you letter on it. From that point on, he did his homework. I was amazed that I could change his behavior with a little piece of paper. I never knew that it could be so powerful. I used to think that children with autism are always isolated, that they cannot learn, and that they don’t understand anything we say. But after I saw and worked with the children in this program, I learned that they are able to learn and that I can help them by being patient and by prompting them so that they can learn new skills. I can see the results already and even when there are challenges along the way, the progress is always evident in the end. I want to continue to earn the trust of children with autism. Knowing that I can do something in the future to support this population motivates me to continue. As Syrian refugees, life has been unfair to our children and we need to do what we can to give them a good education so that they can have a chance at a better future. I benefitted so much from this program already and I would like other teachers to experience those same benefits. I think that every teacher can benefit from learning strategies to support children with autism, behavior challenges, and learning differences. A Global Voice for Autism’s Got Talent! What a better way to start the day than with a talent show? Today, we woke up early to prepare for siblings and parents support session, where our team members got the chance exhibit their talents and artistic skills. Sarah climbed the walls of our apartment to show us some of her climbing tricks, Qiess displayed his professional drawing skills, and Melissa played the “Cups” song using a glass, a small table, and her own fists while Amal sang the song along, and I taught the group how to make origami butterflies. After this refreshing and entertaining start, we headed to the center to meet with the parents and siblings of children with autism. We started the session by reviewing the performance of the participants in last week’s assignment, “Try to Fail”. It was phenomenal to hear stories about how the members of the community in Mersin are willing to help children with special needs, especially children with autism. “I went to a local pharmacy and asked the pharmacist to fill up the water bottle for Reema and told her that my child has autism. The pharmacist smiled at Reema and filled the bottle up.” Lama told us. However, the goal of the challenge was collecting as many fails as possible, so we asked the families to do the challenge this week as well. Then, we introduced the theme of this session, which was looking into the skills and needs of the siblings and parents and finding a way to integrate them into supporting children with autism. The first activity was about the challenges and difficulties they face with their sibling/ child with autism. Participants were asked to write the challenges on two scraps of papers, crumble them, then throw them in the center of the room. Next, every sibling/parent chose two challenges they personally relate to and shared with others how they overcame those challenges and learnt from them. “When I want to play with football, and my sister wants to play with the ball, I play with her so we can both enjoy.” Reema’s brother said, 9 years old. The second activity for this session was drawing a tree, where the roots of the tree are the six strengths of the participants, the trunk people who influenced them to develop those strengths, and the leaves are how those strengths are manifested in situations in their lives. We discovered that most of our siblings and parents are very artsy and have many unique skills. “My patience is manifested in enduring my daughter, Haya, screaming all night.” Haya’s mother commented when she was asked about her strengths. “I am sympathetic. I also love people who sympathize with my brother. I love my brother.” Ali’s sister, 5 years old said. “A Global Voice for Autism was one of the things I wrote on my tree trunk.” Reema’s mother explained how this program impacted her. In the next support session, parents and siblings will get the opportunity to display their talents and special skills in front of the other members of the support group. We can’t wait to see them unleash their talents and surprise themselves and us!